On behalf of everyone here at AnyMeeting, I would like to thank all of our avid AnyMeeting users for a great 2012! If it wasn’t for all of you, we would not have been able to keep growing AnyMeeting, with exciting additions such as the Small Business Toolkit webinar series, the new YouTube feature, an updated user interface, integration with VMware’s Zimbra Collaboration, Single Sign-On from the Google Chrome Web Store, and so much more! We hope that you’ve had a very prosperous and productive year, and we look forward to being your choice for web conferencing and webinars in 2013. Happy Holidays and a very Happy New Year! 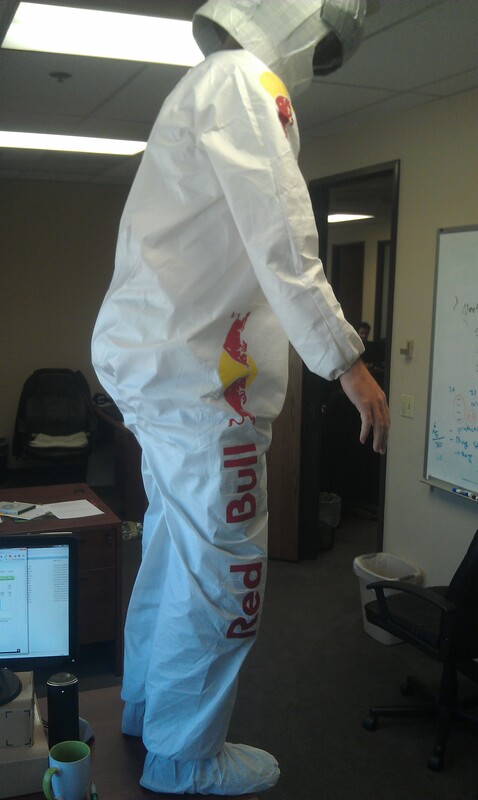 The Halloween spirit is alive and jumping at AnyMeeting, with everyone getting into the fun. Just about everyone at AnyMeeting headquarters was in costume and participated in our inter-office space Halloween costume contest. 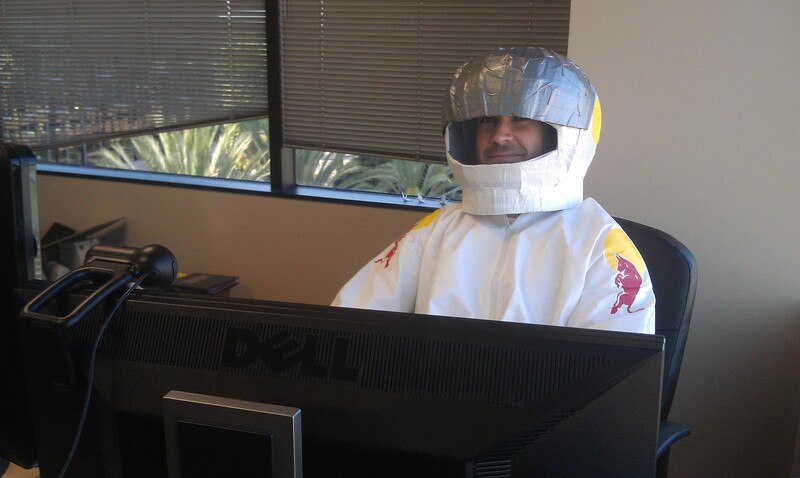 Colin, one of our developers, took the honors when he came dressed as space defying and sound-barrier breaking Felix Baumgartner. Dressed in his flight suit and helmet, Felix was ready to break more records with an entirely new jump. 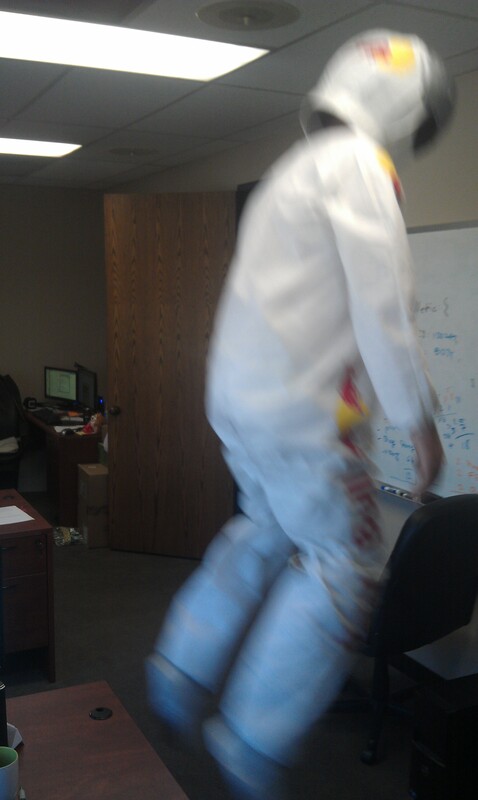 From a dizzying height of the top of his desk, Felix once again prepared for a leap of faith. When everything was set, he stepped off and quickly reached a maximum speed of three feet per second for a total distance of about three feet. The journey was a complete success, and only took a second. Our death-defying developer is now resting comfortably at his desk recalling his epic journey, and wishes everyone a Happy Halloween!!! !